In recent years, the Kurdistan Region experienced high economic growth rates due to its generous investment law, its progressive economic policies, and a stable security situation. These factors turned it into an attractive destination for international corporations and made the Region the main gateway to the rest of Iraq. In addition to its abundant natural resources which are the backbone of the economy, the Kurdistan Region is also recognized for its significant economic potential in other areas. The Kurdistan Regional Government has identified three priority sectors, in which foreign investment and trade are especially welcomed. These three areas are agriculture, tourism and industry. The KRG firmly believes in long-term partnerships with the private sector in order to advance the Region´s development and build a sustainable future. It is working with international experts and consultancy firms to devise plans and strategies for the development of the Region. In recent years, the Kurdistan Region has experienced accelerating economic growth in all areas. The recent boom in the housing and real estate sector has been reshaping the landscape of the Region and transforming the capital Erbil into a commercial hub. The energy infrastructure has been vastly expanded, dozens of schools and universities have been erected, and the health sector has been improved. Hundreds of kilometres of new highways allow for quick transportation throughout the Region. The new Erbil International Airport, which opened its doors in 2010, is seeing increasing passenger numbers every year. An additional airport is already operating in Sulaimani and the construction of an airport in Duhok is under way. Once referred to as the bread basket of Iraq, the Kurdistan Region’s agricultural sector has the potential to again become one of the drivers of economic development of the Kurdistan Region and regain its old strength as an export sector. The regional assets are fertile soils, arable land, a beneficial climate and abundant water resources. Key investment opportunities can be found in fish farming, milk, olive, red meat and seedlings production as well as in the Greenbelt Erbil and the Shamamok irrigation projects. The tourism and hospitality sector of the Kurdistan Region is one of the fastest growing. With its rich and varied cultural and natural heritage including archaeological sites, rare forms of Islamic architecture, early Christian churches as well as beautiful natural sites of all kind, the Region is an exciting holiday destination. The expansion of tourism allows for balanced growth and the development of an integrated economy. The Kurdistan Region of Iraq is seeking to enhance and expand in many areas of the industrial and manufacturing sector by encouraging foreign and domestic investors to take part in this endeavour. The erection of steel and cement plants is of vital importance for the booming construction sector in the Region. Having grown immensely since 2003, the housing and real estate sector of the Kurdistan Region remains highly receptive for foreign and domestic investment. Due to high migration flows into the Region, the construction and housing sector is expected to continue to flourish as a result of increased demand for housing units, hotels, schools and hospitals. The construction sector contributes significantly to the development of local economy and job creation. 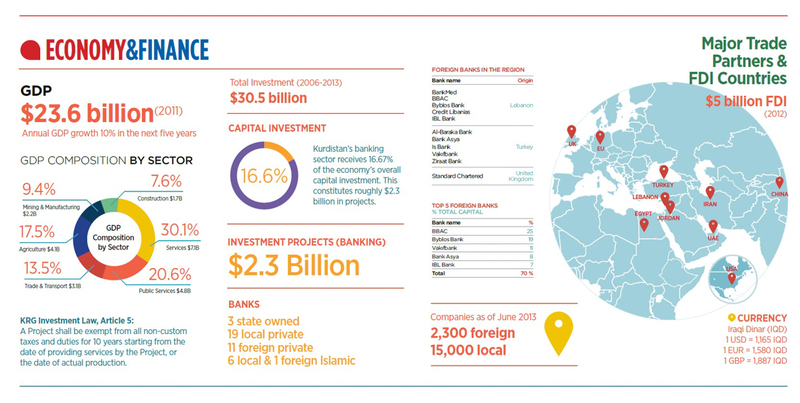 The banking and finance sector of the Kurdistan Region of Iraq is developing rapidly. The Kurdistan Region is now home to over 15 headquarters in the fields of commercial and retail banking. Furthermore, joint ventures between domestic and international banks have been formed. The soon to be opened Erbil Stock Exchange will complement the Iraq Stock Exchange (ISE) in Baghdad and is expected to make investment in the Kurdistan Region even more attractive. The insurance sector is also quickly expanding, contributing toward the emergence of a healthy and efficient banking system that meets local and international needs. The KRG has identified the communication and transportation sector as being central to the general economic development of the Kurdistan Region. The regional government has also developed a transport strategy to further advance the Region’s already well-developed infrastructure. The Kurdistan Region of Iraq is welcoming both public and private investment in its health care sector in order to overcome the consequences of the long negligence by the former regime in Baghdad. An important prerequisite for the expansion of the sector is the establishment of internationally compatible health and safety standards. Hospitals and health clinics are among the top priorities for infrastructure projects. The education sector in the Kurdistan Region is undergoing a tremendous transformation process. Investment in this sector has been steady in recent years, centring on construction, human capacity development, scholarship programs, recreational programs, and research programs. With the growing international community and the return of diaspora communities, and growing IDP and refugee communities, the Region is in high need for more international schools. With a large youth population and a strong cultural heritage, the KRG is firmly commited toward the investment in its arts and sports sectors.